I’m not going to lie: sometimes baking every single week is a bit of a chore. Some weeks it’s a great excuse to try out a recipe you’ve been thinking about, or a nice quiet activity for a rainy day. But sometimes you’re coming down with a cold and you’d much rather curl up in bed and marathon Elementary. So this week, I went with something without too much hands-on work involved. Still delicious, but I could just whip the batter up, put the whole thing in the oven for half an hour, and be done. I’ve made these blondies heaps of times, because I love peanut butter and chocolate and (sometimes) things that are easy to make. This time I changed them up a bit. Normally I would follow the original recipe exactly, just using chocolate chips and covering the top with rich dark chocolate ganache. 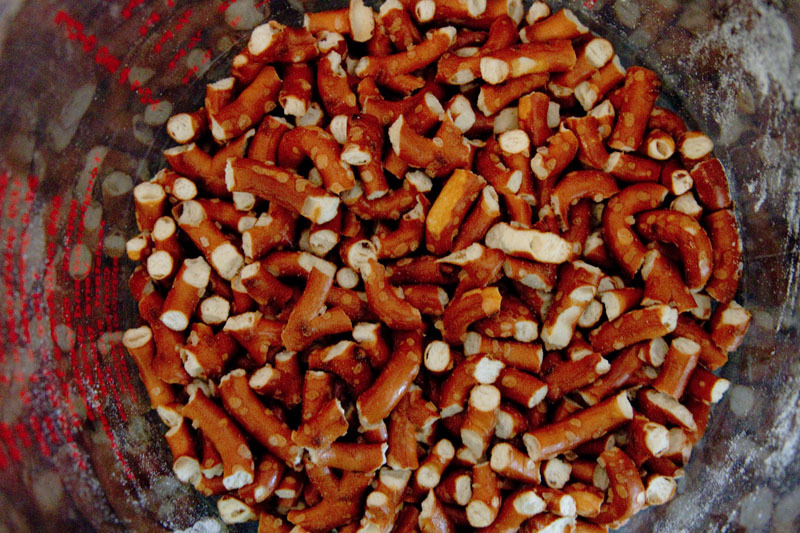 But this time I wanted to do something different: add pretzels. Pretzels, peanut butter, and chocolate go together amazingly. So I changed the batter around slightly to be a bit richer and softer, crushed up some pretzels, and skipped the ganache. The results were excellent. 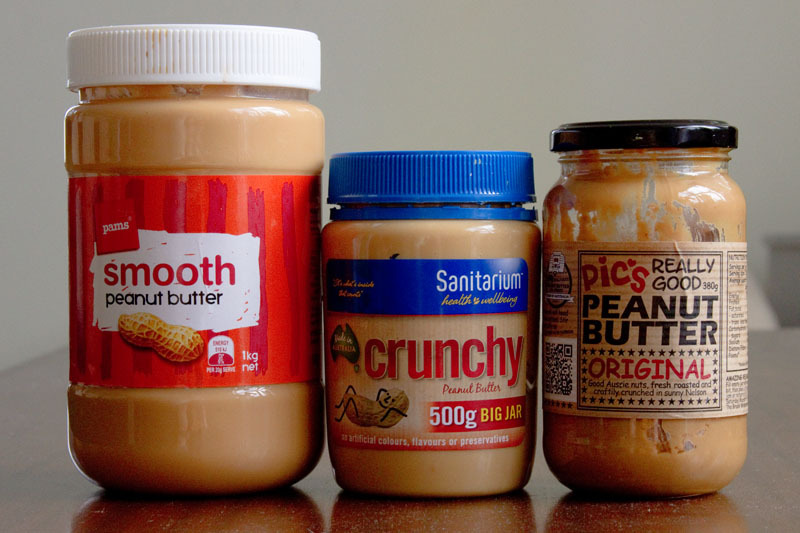 A (not so) quick word about peanut butter in New Zealand: Peanut butter is probably my favorite food in the entire world. (With the possible exception of sunflower seed butter, but that’s a post for another time.) Unfortunately, peanut butter in New Zealand is terrible. I don’t know what you kiwis are doing wrong, but you need to sort it out. 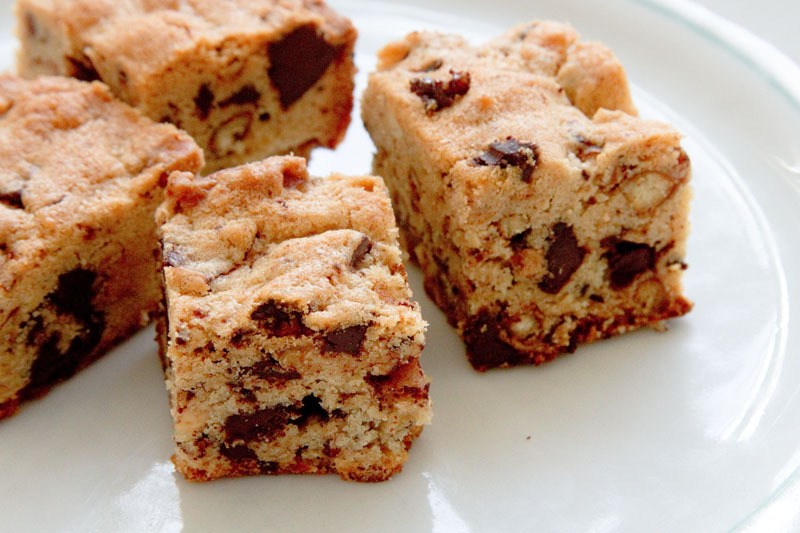 For those of you in the US, this isn’t a concern – you can use pretty much any peanut butter for these blondies and they’ll be all good (except for the low-fat kind…that stuff just tastes like sugar and chemicals). In New Zealand, however, I would recommend shelling out an extra couple bucks for something all-natural: just peanuts, salt, and maybe a little bit of oil. You’re best off steering clear of Pam’s or Budget brands, but don’t feel like you have to pay through the nose for the really good stuff (Pic’s, 100% Nutz, etc.). You’re not eating it by itself, you’re baking with it. And without further ado, the recipe. 1. Preheat oven to 325 degrees Fahrenheit (160 Celsius). Butter a 9×13 inch pan. Line the bottom with baking parchment, then butter the parchment. 2. In a large bowl, cream the butter until soft and smooth. Add the sugars and beat until light and fluffy. Beat in the peanut butter until thoroughly combined. 3. Beat in the eggs, egg yolk, and vanilla. 4. Add the flour and salt together and mix until just combined. If using an electric mixer, make sure you lower the speed so the dry ingredients don’t go flying all over your kitchen. 5. Fold in the chocolate and pretzels, stirring until evenly distributed. 6. Transfer the batter into the prepared pan. Spread as evenly as possible, then smooth the top with a rubber spatula. 7. Bake until puffed and deep golden. 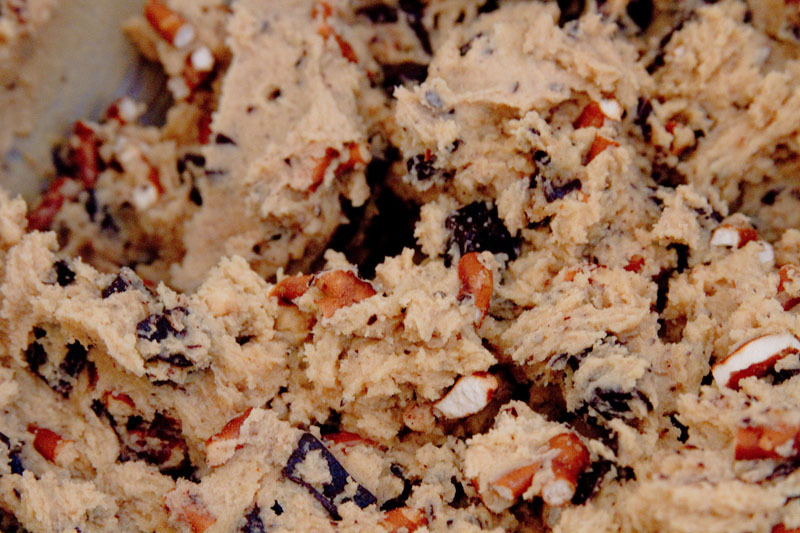 A tester should come out nearly clean, with just a couple crumbs at most. This can take as much as 45 minutes, but make sure you’re checking from about 30 minutes on – no one wants overdone blondies. 8. Remove from oven and cool completely before cutting. The original recipe says it makes 32; I got a good 60+ bite-sized blondies out of one tray.